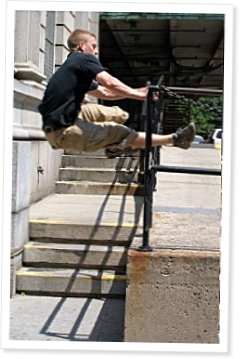 With these last two moves, my series of articles on parkour basics is in its final stretch. From this point out, I will focus on showing some manageable progressions for scaling these movements for the general population and showing how to incorporate many of these principles in your everyday training. While I’ve tried to group the previous movements into some semblance of order by similarity, these last two features are the leftovers, differing from each other in all but the fact that they are performed by the same human body. That being said, they can be two of the most fun and useful movements that you can learn. So without further ado, I present to you the underbar and gate vault. The underbar is quite simply an extension of a simple swing. Where this movement differs from the general swing that you might perform on a high bar is the fact that you will use your core strength and the speed of your approach to focus this swinging movement horizontally through a restricted area. This can be useful in situations such as quickly navigating the space between two railings or when you take to moving through the trees, monkey style.